Graduation parties should be ALL tassel and NO hassle. 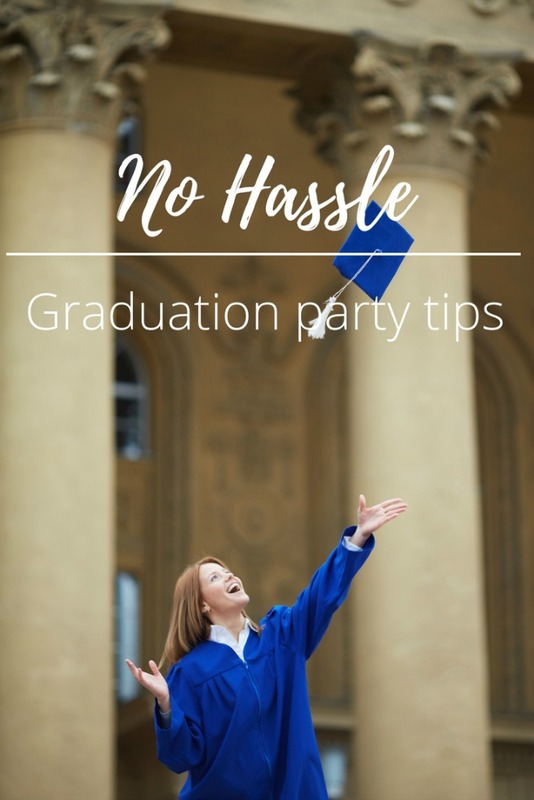 These No Hassle Graduation Party Tips will help you find ideas for your graduate's party! Graduation season is here! What an exciting time for everybody. For seniors, it's the first step into the next chapter of the book of life. Whether going to college, trade school, traveling, finding a job, whatever- this is an enormous milestone in life. Here are some party tips and ideas so you can focus on the tassel and not the hassle! This is a huge event and there is no better time than now to capture the memories. Parties are a LOT of work and as the host, it's hard to find balance between photographing the party and hosting. Set up a photo booth! It's super easy to do- chalkboard background, frames, mustaches, funny props, etc and a camera. Take turns with designated photographers so the party can be enjoyed and memories are still being captured. **Social Media- ask guests to use a special hashtag for images they share on social media, keep extra photos designated and easy to find. We all know that graduation is the PERFECT time to show off those childhood photos. Create banners with photos of the graduate of all the sweet and happy memories. What a great way to showcase the graduate and embrace the nostalgic memories. At the entrance, have a table set up and ask guests to write down words of wisdom or special memories and put them in a designated jar/box/chest for the graduate to read later. We all want to mingle at the party- so set up food bars instead of having designated servers. Taco bar, hot dog bar, s'mores bar, popcorn bar, walking taco bar, ice cream float station, etc. The ideas are endless. Allow guests to go through and serve themselves. **Extra idea- for perishables such as lettuce, sour cream, etc.- get a small blow up raft and fill it with ice and put in on a table. Keeps drinks and food cold! 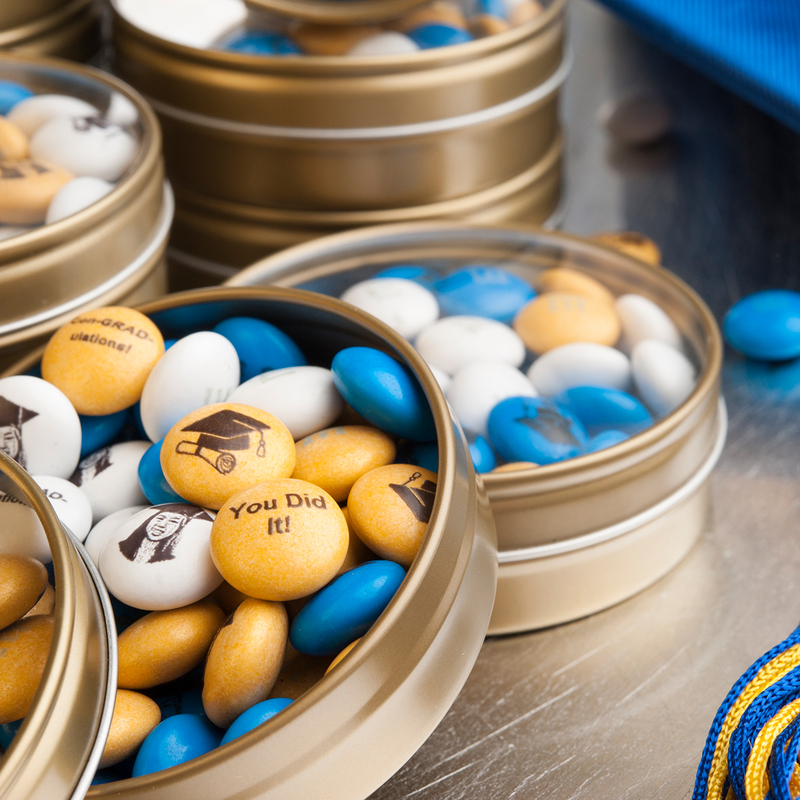 Personalized water bottles, t-shirts, and candy are perfect for any party- especially for a graduation party! M&M'S® has an incredible selection of colors to personalize M&M'S® and the ability to add pictures, clipart and meaningful text! Evite® has an incredible selection of invitations to fit any graduate! Personalize them and send out themed invitations to your guests! Evite® is an easy way to keep track of RSVPs! ALSO Evite® Vendors powered by GigMasters makes it easy to book vendors (photographers, rentals, etc) and entertainment for your graduation event by removing some of the burden off the host, or streamlining the planning process.